Frugal Mom and Wife: Old Navy Flip Flops Only $1 + 10% Off Coupon! June 29th! 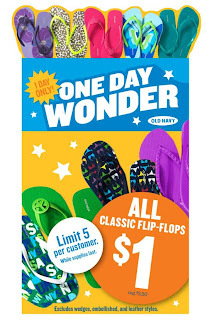 Old Navy Flip Flops Only $1 + 10% Off Coupon! June 29th! June 29th you can get up to 5 pairs of flip flops for only $1 each. That's per person, so bring your friends. This is way popular and can get as crazy as black Friday at most stores. Be prepared and the earlier you get there, the more likely you'll get your size. 10% off your entire purchase (Facebook) to make it a bit cheaper.